Bite-Sized: Dominate | Wake up, Meeples! Dominate is a lot of points. Similar to Colony, when it’s available, you’ll find that almost all of the time it’s the source of VP that you want to be going for, simply because of how many points you can score. Most other strategies struggle to score enough points to compete with a player who goes for Dominates, particularly just Provinces. 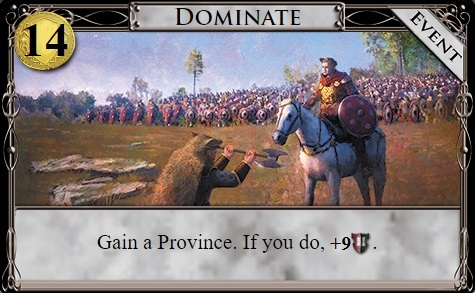 With just two Dominates, you’ve scored the same number of points as a player who had to put five Provinces in their deck, and it’s quite easy to overcome the VP deficit from six Provinces with just two Dominates and a few Duchies. The big difference between Dominate and Colony is that you don’t have a baked-in way to hit $14 — you need some support. Just drawing five cards and getting a bunch of Golds isn’t going to cut it here, you need some form of +Cards to have a shot of getting Dominate in enough time to win the game with it. Cantrips or terminal draw cards can work for this, but without at least something for support you may not be able to make Dominate happen. That said, most of the time you can find a way to hit $14, and the reward is huge when you manage to get there. This entry was posted in Bite-Sized, Dominion, Tabletop Games on April 4, 2019 by Adam Horton.